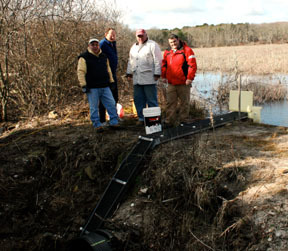 The seasonal migration of American eels from Nantucket Sound through HCT’s 60-acre Bank St. Bogs Nature Preserve to Grass Pond in Harwich Port has been restored with a low-tech, low-cost, but highly effective “eel ramp” on private property allowing young eels to wriggle up and over a flume to their freshwater destination. The project also proves that cranberry farming on a nearby private bog and eel migration can co-exist. 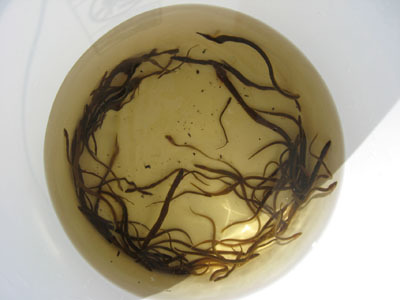 American eels (Anguilla rostrata), hatch from eggs in the Sargasso Sea in the North Atlantic and migrate to freshwater systems. This eel species follows a catatromous life cycle. Adults spawn in the salty Sargasso Sea. Eels hatch from eggs, migrate to the east coast, and travel up freshwater streams into ponds to mature. The adults then return many years later to the Sargasso Sea to spawn. The Sargasso Sea is probably most famous because of its location in the Bermuda Triangle, sometimes referred to as a “graveyard for ships” where many vessels over the centuries have mysteriously disappeared. The instinctive migration of the American eel is also somewhat of a mystery. For comparison, river herring follow an anadromous life cycle, maturing at sea, then migrating up freshwater streams to spawn in freshwater ponds. The eel’s general decline along with habitat disruption have created opportunities to aid migration, and therefore survival of this unique species. When it was first installed in 2008, HCT’s eel ramp was only the second in Massachusetts . Since then the ramp has enabled tens of thousands of young eels to complete their lengthy journey from the sea. The eels provide an important food source for a variety of wildlife and will hopefully mature into spawning adults in the years to come. HCT is partnering with Brad Chase from the state Division of Marine Fisheries, the Town Conservation Commission, Town Harbormaster Tom Leach, and Don Liptack, the Barnstable County District Conservationist for the U.S. Dept. 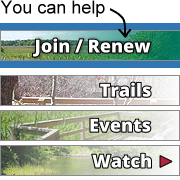 of Agriculture’s Natural Resources Conservation Service which administers the Wildlife Habitat Incentives Program. HCT volunteer Rich Cooper continues to provide valuable technical assistance. As part of HCT’s “citizen science” project, volunteers Mike O’Neil, Matt Cushing, Dave Crestin, Beth Bierbower and AmeriCorps member Peter Woodruff are conducting field observations to document the total number of migrating eels. Thanks to volunteer support, the eel migration ramp is restoring an important species to an intricate set of connected ecosystems.